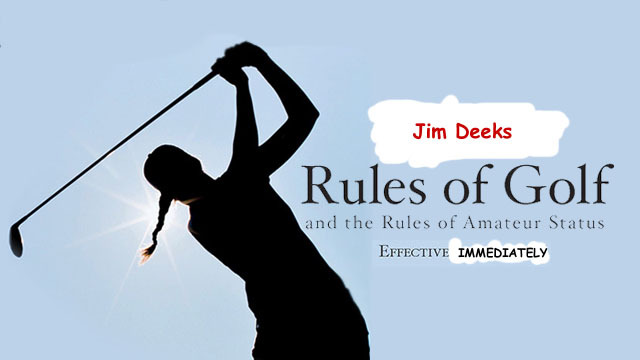 Three friends emailed me the other day with news of the proposed rule changes from the joint R&A/USGA task force. At least, I think it was a task force. And in all honesty, I would’ve called it a task FARCE if they hadn’t actually made some pretty useful and intelligent suggestions to bring the game’s standards into the 21st Century. I’m particularly pleased that they’ve found some collective sanity and decided that an inadvertently touched ball will no longer constitute a counted stroke; that bumps on the green caused by spikes can be fixed (not that anyone wears spikes any more); and there will be no penalty for moving loose impediments in a bunker, like rocks, or sleeping drunks. Good show, chaps! Nonetheless, as I’ve intimated here in the past, and I said succinctly to one of my friends in response to the changes, if I had been appointed by the August Bodies as a Task Force of One, I personally would’ve just thrown the old Rule Book out, and started with a blank sheet of paper. Actually, I would’ve set out two pieces of blank paper, and stopped when I came to the bottom of page two. And in fact, as your ‘umble servant, that’s what I’ve now done. No game of 18 holes can take more than 4 hours, regardless of the number of players in the group, and regardless of how many times the cute girl in the refreshment cart comes by. Penalty for excess time: 1 stroke per person per minute over. After 15 extra minutes, police will be called. If a ball goes into the woods, or anywhere where a shot toward the hole isn’t worth trying, the player may bring the ball to the edge of the woods (or other obstruction), and play the next shot from within two club lengths of the edge. Penalty one stroke, whether the friggin’ ball was lost or not. There will be no situation in the game of golf in which there is a two stroke penalty. There will be no situation in the game of golf where returning to the tee or location of the previous shot is warranted. There will be no stakes of any kind or colour, marking anything. The only steaks allowed on the property will be served in the Grill Room. If a ball is sitting near a tree root or rock (larger than a pebble), such that to attempt a shot would result in a broken wrist or worse, the ball may be moved within one club length so as to avoid such injury. When a ball is hit into a water hazard, the next shot should be played from within two club lengths of where the ball crossed into the hazard. Penalty: one shot. That’s pretty simple to understand, right? If you’re not sure whether the ball went into the water, you may look for thirty seconds, but then get on with it, for heaven’s sake. Three putts will be the maximum allowable on any green. In other words, sunshine, pick it up after two misses, okay? If you have already shot three over par on any one hole, including penalties, and regardless of your handicap, pick up your ball, mark down your triple on the scorecard, and move on. Please! If you land in an unraked footprint in a bunker, take the ball out and place it gently on ‘proper’ sand, within six inches… unless you buggared up your first shot and the footprint is your own. If you’re in the woods, and you’ve decided to play the ball out from there, you are allowed to take a maximum of two practice swings. If you touch a leaf, or inadvertently knock off a branch on these practice swings, who the hell cares? No penalty. Any shot which hit a sprinkler head and bounded off to God knows where may be played from beside the sprinkler head it hit, no penalty. Yes, I know it MIGHT have bounced onto the green, close to the pin, but we have to draw the line somewhere, duckie. Any golfer who has an electronic, remote-controlled golf cart (alright, ‘trolley’ if you insist) MUST have a certified license which proves he/she has taken a minimum of 12 hours instruction on how to use the damn thing. BONUS RULE: This applies only to me. If there was a noise that occurred in your backswing, which distracted you and caused you to mis-hit your shot, you may repeat the shot. Assessment of this distraction will be made only by me, at my discretion. So, other than these simple guidelines, yer on yer own. Enjoy yer day.